While up in Speyside in February I didn’t do all that much out of the ordinary – I was driven around, drank beer, drank whisky, stood on some skies, drank some more beer… However, in a fit of ‘surely that can’t be all there is to it’, we made an excursion on our last day to The Heather Centre. While I will give it some benefit of the doubt due to the rather heavy snow outside, I don’t think it will make it on to my list of ‘must visit’ sites in the Speyside region – it was a garden centre. It had everything you’d expect from a garden centre, with garden stuff, strange nicknacks and a kitchen section with a video on loop showing how you! can have a device that does not only one useful action but three! and it’s both easy to clean and lots cheaper than you’d think! On top of those and the inevitable tartan boxed shortbread it had a shelf of booze. 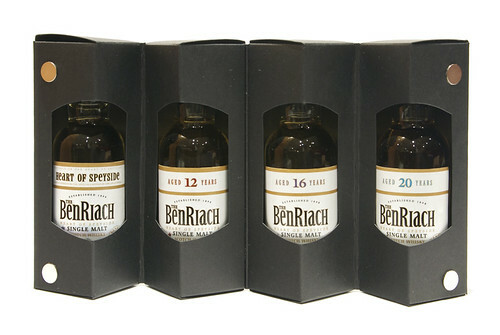 There were some vaguely interesting bottles of whisky on there, along with some Caorunn Scottish Gin (that I had little nip of – it tasted of gin), but as I had a rather full rucksack to drag back south I decided to grab a box of miniatures – The silver boxed, BenRiach Classic Speyside collection. Yes, I can see this is black. The slipcase outside the box was silver. The silver box comment is only important because I found out at Whisky Live that they also do a gold detailed box which has some of their other whiskies in, including their peated Curiositas. It was very shortly after learning this that I bought a bottle of Curiositas (as seen in my recent whisky tasting) based on a) drunkenness b) the nice man giving me some distillery pin badges and c) my feeling slightly foolish at not having checked out what the other box on the shelf at the Heather Centre contained. Anyway, this box contains four 50cl bottles across their standard range. First by age is the Heart of Speyside – the no age statement entry level single malt. It’s very lightly coloured and has sweet grain, vegetable oil and raisins on the nose – a bit like a boozey muesli (breakfast of champions). To taste it’s quite strange – quite fresh with flowers and heather, backed up with a slug of furniture polish. Whisky tasting assistant Anna hit the nail on the head – ‘Mr Sheen, but in a good way’. Water brought out some other flavours, with vanilla and Refreshers (the chalky loveheart ones, not the chews) joining the flowery, perfumed taste. Interesting, and definitely benefiting from a delicate dilution. Next up is their 12 year old. This one continues the theme of the last, with flowers and furniture polish on the nose, but also has some caramel and toffee along with a generally increased richness, as you would hope with <unspecified number> of extra years in the barrel. To taste it has some woody vanilla and a warming spiciness, along with a slug of wood and a bit of linseed oil. Water rounds things out and makes it a lot sweeter, leaving honey and linseed oil fading to a woody taste on the finish. Quite nice, but a bit sweet for my liking. Third in the box is the 16 year old. Again, this one is a development of the last, but this time some of the floweriness has gone, leaving light honey and heather, and a little bit of saltiness has crept in. To taste it’s very different, with leathery wood, tannins and a peppery smoke almost hiding the honey sweet oiliness of the previous two. A drop of water opens up the wood into a creamy vanilla, with a touch of smoke and a dry finish. I rather like this one and suspect a bottle may make its way into my cupboard at some time in the near future. Last on the list is the 20 year old. Further development of flavour here, with a nose of oiled wood, caramel and damp cardboard. The wood has really influenced this one and at first it tastes almost like a dry bourbon, but on top of that there a chunk of sweet lemon, leather and dry tannins. 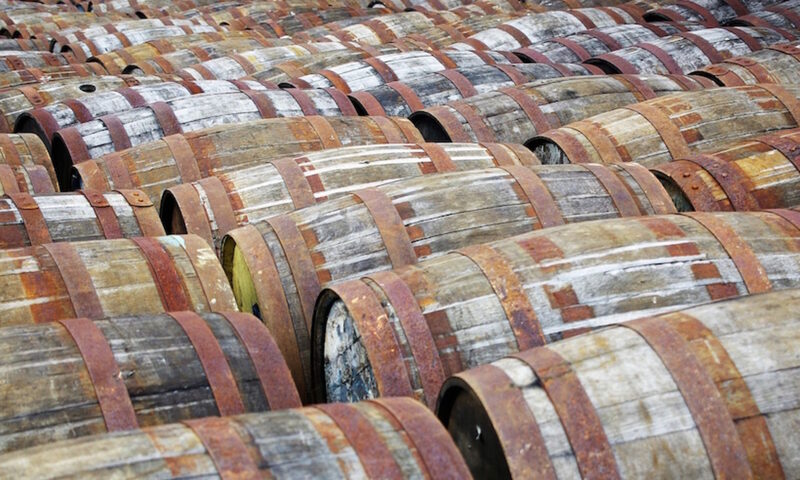 A drop of water loosens the whole lot, softening the heavy woodiness to a creamy vanilla, allowing the honey and linseed of the younger whiskies to sneak out and be rounded off with a woody finish. A nice dram, yet again, but not a patch on the 16 for me.